This article shows how to do champleve enamel work to create beautiful jewelr. Sam Gorelick shares his background and skills for champleve jewelry making. My formal education includes a Bachelors Degree in Chemical Engineering and a Masters Degree in Mechanical Engineering. My interest in enameling started when my son received an enameling kit as a present. I was intrigued with the beauty and permanence of the enamels on metal surfaces. 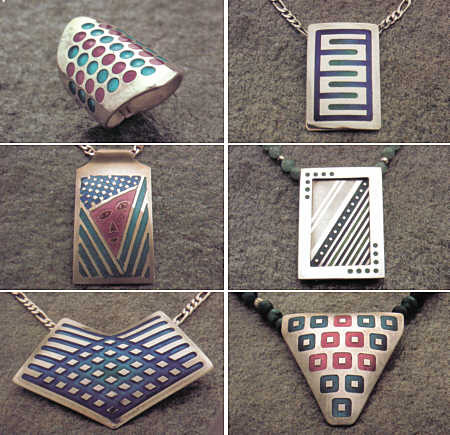 Upon retiring from my engineering position with the Department of Defense in the Pentagon, I decided to actively pursue the making of enamel jewelry as a hobby. To further this goal, I took numerous courses in all phases of enameling at Montgomery College in Rockville, Maryland and this was supplemented by attending workshops given by world-class enamelists. In addition I attended college level courses at the University of Maryland. Figure A shows a picture of a small milling machine suitable for mounting on a worktable. Basically, the machine can be considered a sophisticated drill press utilizing bits called end mills. These bits have a flat bottom so that the cut is smooth. The machine shown in the exhibit [there are others] consists of two parts: 1) a vertical milling head about 23 inches high weighing about 16 pounds and, 2) a milling table about 19 inches long and 4 inches wide weighing about 30 pounds. The unit is shown with an accessory to permit precise angular and circular scoring of the metal. The particular feature which distinguishes the milling machine is the precise control of the milling bit [to .001 inch] in the X, Y , and Z directions by means of turning 2 wheels and a screw which regulates the depth of cut. The milling bits are available in many sizes permitting the width of cut or diameter of a hole to be precisely controlled. Samples of champleve jewelry created using a milling machine to engrave the recessed surfaces. All pieces shown are by Sam Gorelick. As with all jewelry, the first step is to develop a design utilizing the capabilities [and limitations] of the milling machine and the application of enamels. Based on experience, the best metal thickness for enameling utilizing the milling machine is 16 gauge in fine silver or copper. In view of the precise control needed in the depth of cut the metal must be absolutely flat. The optimum depth of cut is normally one half the thickness of the metal. The blank metal piece is secured firmly to the table of the machine which is precisely moved under the rotating milling bit by turning the control wheels and depth screw. Normally it is necessary to make several passes of the milling bit to reach the final depth of cut. The scored metal is removed from the machine and normal enameling procedures utilized to make the finished piece of jewelry. The pictures shown illustrate the versatility of the milling process in producing precise crisp cuts for application of enamels. The jewelry produced should provide an interplay of lines and planes in geometric patterns coupled with the shading and luminosity of the enamels chosen for the individual design. To my knowledge I am the only enamelist utilizing this technique for making champleve jewelry.